Free-spending Paris St Germain demonstrated their prowess with a 5-0 thumping of Celtic in their Champions League opener at Parkhead. 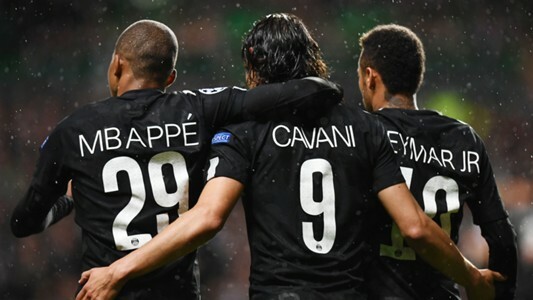 The world's most expensive frontline did the damage in the first half as Brazilian star Neymar opened the scoring in the 19th minute before 18-year-old French sensation Kylian Mbappe added a second in the 34th minute with Edinson Cavani scoring with a penalty before the break. A fan from among the home supporters revealed his frustration when he came on to the pitch to aim a fresh-air kick at Mbappe before being escorted away by stewards and there was more distress after the break. Brendan Rodgers' side performed better in the second half but in the latter stages Celtic defender Mikael Lustig put through his own goal before Cavani grabbed his second with a clever header to hand the home side their record home defeat in Europe. It was always going to be a tough task for Celtic who had striker Leigh Griffith back after recovering from a calf problem and 18-year-old Anthony Ralston tasked with taking on Neymar as regular full-back Lustig was moved into central defence. The French side broke the world transfer record when they signed Brazilian superstar Neymar from Barcelona in the summer for £200 million and Mbappe joined on a season-long loan from Monaco, with an option to make the deal permanent for £166 million, and they were both instrumental in a fine PSG performance. Ralston was warned by Italian referee Daniele Orsato for his second foul on Neymar just before Cavani had the ball in the net from a Layvin Kurzawa cross only to be ruled offside. Celtic goalkeeper Craig Gordon made a decent save from Cavani's long-range strike before the visitors went ahead. The home fans claimed for a foul on Hoops attacker Scott Sinclair by Dani Alves before PSG regained possession and Adrien Rabiot slipped Neymar in behind Ralston and he raced into the box and lifted it over the onrushing Gordon with assurance. Minutes later Griffiths came close to levelling with a 25-yard free-kick that was tipped over the bar by Alphonse Areola, the keeper taking the resultant corner with ease. The slick-moving French side were in control, however, and their second goal came from a deep cross from the right by Thiago Motta which was headed down by Neymar and although Cavani missed his kick from eight yards, Mbappe was on hand to fire the ball high into the net. Five minutes from the interval Jozo Simunovic conceded a needless penalty and picked up a booking for a tug at Cavani as he attempted to reach a cross from Kurzawa and the Uruguayan picked himself up and slammed in the spot kick for number three. Moments later, there was a holdup as a fan ran on and appeared to aim a kick at Mbappe before he was hustled off by stewards, an incident sure to land the Glasgow club in more trouble with UEFA. Sinclair had a shot saved by Areloa before the first-half but Celtic looked down and out. Tom Rogic replaced Stuart Armstrong for the start of the second half and the Scottish champions tried to rally, backed by their supporters. Ralston was booked for a foul on Motta and as the home side enjoyed a measure of possession Areola again denied Sinclair from close range after the Hoops forward had skipped past Marquinhos. Julian Draxler came on for Rabiot and Celtic's French striker Odsonne Edouard replaced Griffiths but Neymar had three more attempts on goal, one over the bar, one saved by Gordon and the next sent past the post before the Brazilian was booked for simulation in the 76th minute. There was more woe to come for the outclassed home side.